This fully assembled product has 1 reader and 10 writer. Pioneer drive enabled duplicators offer exceptional value. All units are built in the UK using the highest quality components sourced from around the world. When you invest in a Pioneer CD or DVD duplication system you can be confident you will receive a quality product manufactured to the highest standard at a great price. 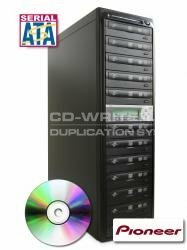 You do not have to be a computer user to operate the Pioneer DVD Duplicator system. All current DVD and CD formats including the CD+G (Karaoke CD) and CD-Text can be copied. DVDs burn at a selectable 20x/16x/8x/4x/2x speed while CDs will burn at 32x/12x/8x/4x/2x.Exact image copies of original masters are assured and verified by the duplicators """"Copy and Compare"" feature. The duplicator also offers a ""Test"" function as well as a ""Test and Copy"" feature. The Source Input drive is also user selectable. The machine will also operate in simulation mode preventing the burning of corrupted discs. Once the disc copy process has been completed the copy will be verified before an audio alert is sounded to notify the user that the discs have burnt succesfully. Pioneer . Duplicator . Premium . CD . DVD . with . 10 . drives . SATA . StorDigital . Systems .